In order to find Vinland, you need to know something about the original finders. This section lets you get up close and personal with the Vikings: what they looked like, how they dressed, what kind of buildings they lived and worked in, what type of belongings they had, how their society and economy functioned, and the roles of the men and women in it. To solve the mystery you will have to know something of their ships and navigation skills, their languages and forms of writing and what led them to spread out in all directions from their homelands. 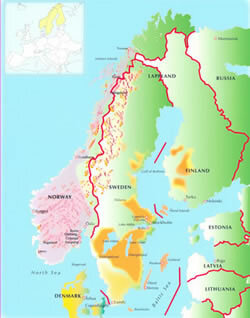 The period between 800 and 1050 AD is known as the “Viking Age” in Northern Europe. The Vikings were descendants of people who had lived in Scandinavia for 10,000 years, and they are the ancestors of most of the people who live in Scandinavia today. At the beginning of the Viking Age, Scandinavia included Denmark, Norway, and Sweden. By the end of the period, Scandinavians had settled Iceland, the Faeroe Islands, and Greenland, established colonies in England, Scotland, Ireland, France, Germany, the Baltic countries, Finland, and Russia, and gained a European toehold in North America. It has become common to call all Scandinavians of the period 'Vikings'. This is not what they would have called themselves. Men were Vikings only when they went raiding, and women could not be Vikings. Historians prefer to call them Norse, [a translation of the Scandinavian word norroen.] Norse' refers to all Scandinavians of the Viking Age and it includes the later centuries up to about AD 1500. Today 'Vikings' have become such a popular concept that the name has become the accepted reference. The original meaning of the term Viking (Vikingr) is 'pirate.' The origin of the word is debated. Many believe that it comes from vik, which is the Old Norse word for 'bay', either 'bay man' or a man from Viken, which is the name of the eastern coast of the Oslo Fjord. Others suggest that it comes from Latin vicus, Anglo-Saxon wic, which means town, a village or hamlet.